As cheap alcohol becomes more accessible to more people around the world, and general views concerning its use appear to become more liberal, alcohol is causing problems around the world. Many more people are contracting alcohol dependency than ever, because it’s now easier to get alcohol and therefore it’s easier to become addicted to it. If issues related to alcohol dependency and addiction are worrying you, it is a wise suggestion to see if you can visit an Alcohol Rehabilition clinic, where professional people can help you or a friend to regain control over your consumption of alcohol and fight your addiction. 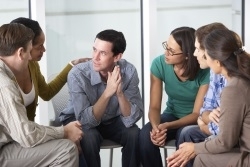 As their name suggests, Alcohol Rehabilitation clinics are there to offer alcohol addiction treatment in the UK, and can speak to you with professional knowledge about anything that affects or is affected by alcohol addiction and the information they give to you is there to help you to turn around your dependence on alcohol and leave behind the alcoholism. For most people, alcohol is little more than a popular drink that they use to increase the amount of fun that they have at an evening party. Whilst it is the case that alcohol can make it easier for you to have fun, it is important that people understand the problems that having too much alcohol can cause. The physical and psychological consequences of relying heavily on alcohol can be disastrous and detrimental to your health. Alcohol Addiction treatment centres are available in the UK for those who wish to lower their dependency on alcohol. By lowering your intake of alcohol, you can then minimise the risk of alcohol related illnesses, such as liver failure, addiction and even cancer. Even for those who are not addicted to alcohol, other problems can be caused by drinking too much of it at once. For example, the famous hangover is a headache and feeling of grogginess as a result of drinking too much alcohol the previous night, which can persuade some people to try to minimise their intake of alcohol content. Unless you are currently in the process of having alcohol addiction treatment or you’re strongly addicted, it may be worth trying to stop drinking alcohol, as the health benefits of doing so may outweigh the difficulty of doing so. However, never attempt drastic action on your addiction without first seeking professional medical advice. Alcohol Addiction Treatment centres in the UK are set up for people to seek advice, guidance and treatment about how to go about reducing their dependency on alcohol, and trying to recover from alcohol addiction. Contact wedorecover.co.uk if you more information about alcohol addiction treatment.